We should place a stronger emphasis on the importance of offering unique corporate gifts because not only do they help improve business ties, they also make your employees feel appreciated. It is, therefore, essential to provide useful and unique corporate gifts to clients. This is because it helps differentiate your company from competitors. Your clients will also be delighted to receive such thoughtful gifts. Unique free promotional gifts and handy corporate giveaways are a simple way to get your brand out there. 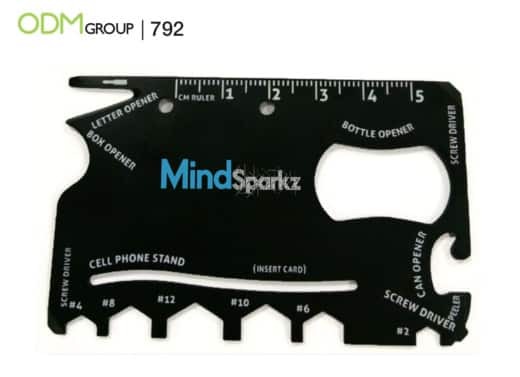 For example, you could offer an 18-in-1 credit card tool as a branded corporate gift. Practical and useful, your recipients will appreciate the gift of convenience. What are the Awesome Features of this Unique Corporate Gift? Apart from the 18 tools you’ll always have with you, here’s another 9 reasons why you should offer this card as corporate souvenirs. 9 Reasons Why this 18-in-1 Credit Card Tool Makes Unique Corporate Gifts? Portable: With its slim design, your clients could bring this gift with them wherever they go. This is because your clients can easily keep it inside their wallet or the back of their phone covers. Practical and Functional: This is a handy tool to have around. Need a peeler or ruler right away? The tool is just right inside their wallets. Lightweight: It would definitely be lighter to bring these 18 tools around as compared to carrying the tools separately. This is because it was designed with convenience in mind. Customizable: One way to gain exposure is by printing your company’s logo on the product. With laser engraving, you can etch intricate details of your logo on the material. This printing method ensures that your branding will not wear off after several use. Higher Perceived Value: By gifting your clients with custom branded merchandise, they will ultimately come to associate your company with high quality products and services. This gives your company a competitive edge. There is also a higher likelihood of them choosing you over your competitors. Increase Brand Awareness: If you offer a custom promotional gift to your clients, you are making it easier for them to remember you. This is because you have created a lasting impression on them with these unique gifts. As a result, you’ll be the first company they will think of should they need business partners to help grow their brand. Enhance Brand Visibility: Your corporate gift should be beneficial for the clients. By doing so, it shows that you have the clients’ best interest at heart – regardless of whether they decide to do business with you. As a result, your clients would be more likely to trust your company and the products and services you offer. Boost Sales: Unique corporate gift ideas can help increase the perceived value of your company and raise your visibility. And these factors combined, leads to a larger customer base. Thus, generating higher revenue and profit for your company. Giving away useful and unique corporate gifts will help maintain good business relations. In addition, it will help in creating greater brand remembrance. Customizing these gifts with your logo or trademark color will definitely increase brand recall. This way, your clients would never mistake you for another company. The reasons listed above make this 18-in-1 credit card tool a unique corporate gift that your recipients will love. Keen on making your own unique corporate gifts, marketing gifts or personalized and promotional marketing gift items for your marketing campaigns? Contact ODM now to learn more about how our team can help you with your future projects. We have a team of product designers with vast experience in designing brand packaging for your business and unique merchandise for your business. We can also assist you in product brainstorming, sourcing and manufacturing. Need more ideas and inspirations such as eco-friendly corporate gifts or gifts for employee appreciation? We have rounded up our favorite blogs about corporate, employees, holiday/festive, and customer gift ideas! Hard to keep track of the things on your table? Solve this problem with these custom desktop organizers! Say goodbye to messy tables and hello to organized ones. A great gift for every company, especially those with palpable tension. Giving a bag to new employees is a good welcome gift idea. Why not take the gift to the next level by adding fingerprint lock for safety and protection? Cybersecurity is a severe and “real” issue. Take a step to protect your employees’ interests by giving them custom webcam covers. Custom Webcam Covers : Trendy Employee Gift Idea! Even if you’re not in the alcohol industry, you can still learn from this promotional wine gifts design. This promotional gift, a kitchen towel, is offered in a wine bottle shape. How and why should you offer designed travel cases regardless of the industry you’re in? Need corporate Christmas gifts but has no idea where to start? You can start with these! Don’t forget to reward your employees during special festivities such as Christmas! Here are some festive employee gift ideas. Christmas Gifts For Employees: Rewards For a Good Year! Wondering how you can pair these promotional gifts with your marketing campaign? Learn from Garden Bread Hong Kong! Garden’s CNY Promotions -Tote Bag and Exciting Gifts Spread Festive Vibe!